Mr Barak Obama is an epitome of modern democracy. In would have been a sheer impossibility for a person of a mixed race from African American to become the president of USA about a decade ago. But he did it in 20 January 2009. He won a second time on 20 January 2013 also showing that Americans really are a true democratic nation above race religion and all petty classification and groupings that appear in tick boxes in a census survey form. Obama in his sixth address, on the State of the Union on January 20th 2015 emphasised that a state should work for the liberty and economic freedom of its citizens. He was eloquent when he said “a better politics unites us”. The gist of his ‘better politics’ relevant to Sri Lankans at the moment when a nepotistic dictatorial regime ofMahinda Rajapaksa (MR), had been voted out by the entire Sri-Lankan citizens, are the following. Obama’s oratory was at best when he said “As Americans, we cherish our civil liberties, and we need to uphold that commitment if we want maximum cooperation from other countries. That’s a better politics. That’s how we start rebuilding trust. That’s how we move this country forward. That’s what the American people want. And that’s what they deserve”. He went on “We need to do more than just do no harm. Tonight, together, let’s do more to restore the link between hard work and growing opportunity for every American”. “A better politics is one where we appeal to each other’s basic decency instead of our basest fears. A better politics is one where we debate without demonizing each other; where we talk issues and values, and principles and facts, rather than “gotcha” moments, or trivial gaffes, or fake controversies that have nothing to do with people’s daily lives”. There was great applause from the dignified audience. He continued “politics – a better politics is one where we spend less time drowning in dark money for ads that pull us into the gutter, and spend more time lifting young people up with a sense of purpose and possibility, asking them to join in the great mission of building America. If we’re going to have arguments, let’s have arguments, but let’s make them debates worthy of this body and worthy of this country. I was really moved when Obama touched on the future wealth of the country the children of the future. “I want our actions to tell every child, in every neighbourhood: your life matters, and we are as committed to improving your life chances as we are for our own kids”. 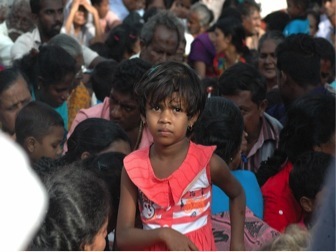 Amantha Perera in IPS of 21 Jan 2015 gave a good picture and account of the Vanni Tamil children who are victims of the 2009 war. Amantha adds “A quarter of a million people who were displaced during the last phase of the war, along with tens of thousands of others who fled at other stages of the conflict, have moved back to the Vanni. Many families with small children continue to live in slum-like conditions, as a funding shortfall has left many without proper houses”. The previous regime of MR had done nothing to alleviate the hardship of those who were rendered homeless in the rounding up and indiscriminate bombing during the war. It had been reported that the war spawned 90000 widows who are still languishing in makeshift temporary huts. It is height of irony and cheek that MR provided air condition rooms for his pet dogs and forgot this Eelam kids and widows. Where has Lord Buddha’s teaching of compassion gone? “By the end of this decade, two in three job openings will require some higher education – two in three. And yet, we still live in a country where too many bright, striving Americans are priced out of the education they need. It’s not fair to them, and it’s sure not smart for our future”. Can the child photographed above enter the steps of a university at least to have a look what it looks like? No one is bothered except Amantha Perera. Unless the concept of ‘two nations’ are accepted equal opportunities for the Tamils will be bleak. Past history from the days of the state council up to now highlight this anomaly. If not some sort of autonomy to the Traditional Homeland of the Tamils of North and East (TH) are finalised the sore of the wounded Tamils will fester further. This is not a pessimistic prediction or doom mongering but the reality. The proposedAmendment 13 is old wine in new bottle. Even to implement this the Sirisena government is appointing a committee to examine the issue. It may be construed as delaying tactics. Procrastination is the thief of time and it is also a sign of hesitation and reluctance to enforce it. MR undertook to implement Amendment 13+ to UN Secretary General, Ban Ki-moon and the Indian Prime Minister, Mr Narendra Modi, but he completely backtracked it till he lost the elections. I wonder if Sirisena is considering doling out only Amendment 13-. Amendment 13 will be detrimental to Tamils and will pave way to the annihilation of the Traditional Homelands of the Tamils of North and East of Lanka that existed for over 2000 years. The 13th Amendment refuses to recognize the existence of the Tamil people as a people with a homeland. The 13th Amendment will do nothing to share executive power with the Tamil people because such power will continue to be vested in the President and in his servants. It will do nothing to secure an equitable allocation of financial resources to Tamil areas because such allocation will continue to be determined at the discretion of a Sinhala dominated Central Government. The basic provisions of the 13th Amendment is the creation of a Provincial Council without control of the power of planning, without control of the provincial budget, without control of police and public order within the province, without control of disposition of state land within the province, without control of higher education and whose remaining meagre legislative powers are subject to the overriding will of the Central Parliament. Finally, the provisions of the Provincial Councils Act itself may be amended from time to time by a simple majority of members present and voting in Parliament. The Tamil National Alliance like the Brahmin in Pancha Tantra storey who was tricked and killed by an old and infirm tiger, fell for the rebottled 13th Amendment. The Tamils rejected it when Rajiv introduced it because it did not give any modicum of control that will give relief to many discriminatory practices adopted by past rulers, DS, SWRD, JR, Srima Bandaranaike, Chandrika Bandaranaike, R Premadasa and MR. These Sinhala supremacist imposed on the Tamils what they wanted according to their whims and fancies. No legal challenges deterred them because they had all political power with them. JR once told a reporter that he has all powers except the power to make woman a man and vice versa. Under Amendment 13 state aided Sinhala colonisation of the Northern and Eastern Provinces will continue because the power of distributing state land will be in the hands of a Sinhala dominated Central Government. Most colonisation in the past in Eastern province was in the fertile land that belonged to the TH eg Gal oya (Paddipallai Aru in Tamil),Inginiyagala and Padiruppu. The 13th Amendment will do nothing to prevent standardisation of admission to Universities, because higher education is a subject excluded from the Provincial List. The 13th Amendment will do nothing to control the abuse of police powers because the subject of ‘Police and Public Order’ in the Provinces will continue to be effectively vested in a Sinhala dominated Central Government. The 13th Amendment will do nothing to prevent the operation of the Prevention of Terrorism Act whose provisions were described by the International Commission of Jurists as a ‘blot on the statute book of any civilised country’ because this too will be within the competence of a Sinhala dominated Central Government. It can introduce it regionally even to crush the minorities in the event of an unjust Sinhala president so decides. The 13th Amendment will do nothing to prevent the operation of the 6th Amendment to the Constitution which according to the International Commission of Jurists, violated the right to freedom of expression. On the contrary, the 13th Amendment will require members of the Provincial Council to take their oaths under the 6th Amendment and acquiesce in and sanction such violation. The 13th Amendment, however, seeks to create a Constitutional frame within which the Sinhala people may rule the Tamils of Eelam more effectively by creating and nurturing a class of Tamils dependent on the patronage of a Sinhala dominated Central Government for their political and perhaps, even their physical, survival. There is no rhyme or reason for introducing Amendment 13 at this point in time after all life sacrifices extracted from the Tamils by war criminals. A new proposal based on true democracy, should be offered by Mr Sirisena on the principles enunciated above by Mr Barak Obama so that freedom signified by the statue of Liberty can be imprinted in the history of this island. Historical and recent history of economic competition and confrontations suggest that a concept of two nation and one country is a robust proposal for the present political problem.